How many of you have been wondering just that? 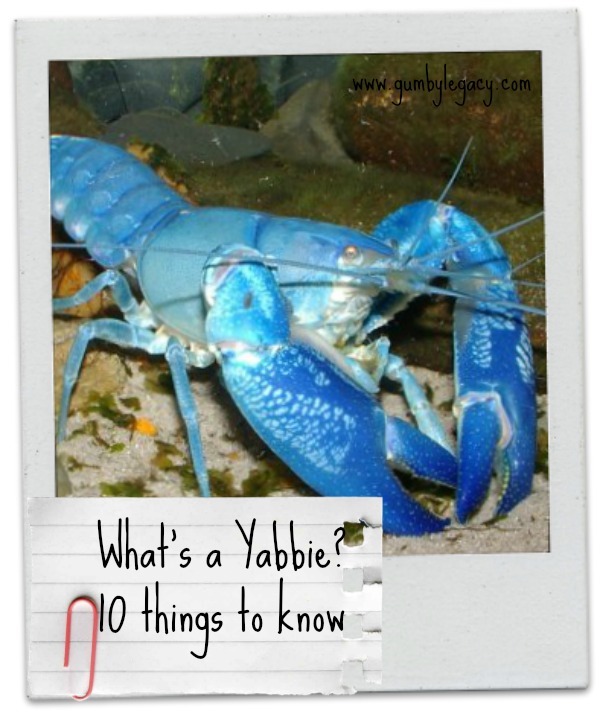 What exactly is a yabbie? There must be a few of you! The reason I wanted to find out is because ’tis the season a bunch of bonkers celebrities head down under to face bizarre and hilarious challenges involving all sorts of weird and wonderful Australian critters. I love it! Tonight there was a tank of yabbies and eels involved and although I know it’s some sort of crayfish type thing, I thought I’d check it out for sure. Yabbies are only found in Australia. Yabbies are crustaceans similar to lobster but much smaller. They live in fresh water. Yabbies change colour depending on their environment. They tend to match their surroundings so in clean, clear water they will be bluer or greenish whilst those living in muddy or dirty water will be brown. Not at all revolting, yabbies do moulting! This is something all crustaceans do numerous times in their lives and is when they shed their old shell, expand in size by absorbing lots of water, and then grow a new shell to fit their beefier body and match existing water conditions. Mum yabbies can lay between 100 and 1000 eggs at once. She carries them underneath her curved tail where they are attached by fine hairs, for up to 40 days until they hatch. This can happen two or three times every year but generally only 5% of her babies will survive in the wild. Yabbies are scavengers. Otherwise known as detritivores, they will eat anything and everything they can find including dead animals, plants, decomposing algae and anything else they can find at the bottom of the river. People eat them like crayfish and kids enjoy ‘yabbying’ in the summer months (much the same as crabbing I think). They tend to be active when it is warm (in local terms this is during months with the letter ‘R’ in them) and go into semi-hibernation when it gets cold (below 16C or 61F). 10. Yabbies have very powerful claws with very sharp tips so they will hurt if they get you! Ha ha…….poor yabbies having to cope with those daft celebrities! Please do comment below and let us know if there are any other weird and wonderful creatures you’d like to know more about. There’s a world of possibilities!